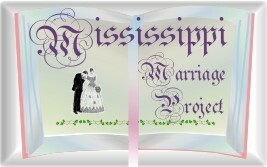 Welcome to the Mississippi Genealogy Marriage Project. This project will endeavor to provide actual transcriptions of Marriage Applications, and other Marriage Records, as found recorded in the county court house and state archives. We are encouraging these transcriptions to be entire marriage books and/or rolls of microfilm. Transcripts will be accepted and files will be placed in the USGenWeb Archives directory of the State and County where the marriage records were originally recorded. Please, send nothing copyrighted, unless you have written permission from the author. Any other use, including copying files to other sites, requires permission from the contributors PRIOR to uploading to the other sites. The submitter has given permission to the USGenWeb Archives to store the file permanently for free access. We are always in the need of help in getting data on-line.